The Channel Marker North Myrtle Beach resort in the Cherry Grove section of North Myrtle Beach, South Carolina marks the point on the Myrtle Beach area coastline where you can see both the Atlantic Ocean to the east and the salt marsh and its channels to the west. It is an inspiring, delightful sight for those who love to bask in the water. Choose this North Myrtle Beach resort for your next North Myrtle Beach vacation if you want to be closely located to the white sandy beaches, the popular Cherry Grove Fishing Pier, beach clubs with live beach music, marinas with Sea Doo rentals and Barefoot Landing where you can shop, dine and be entertained. Channel Marker is a second-row North Myrtle Beach vacation rental which means it is just across the street from the beautiful beaches and the warm Atlantic Ocean. Your family will be so close to the beach when you vacation at Channel Marker that from the private balcony in any of the North Myrtle Beach vacation rentals at Channel Marker you can glimpse the sparkling ocean waters. Speaking of sparkling ocean waters, there is more water than the Atlantic Ocean in which you can swim when you reserve a North Myrtle Beach condo rental at Channel Marker. Check out the sparkling blue swimming pool at this North Myrtle Beach resort. This resort’s swimming pool is on the front of the building and faces North Ocean Boulevard. Relax by the beautifully inviting swimming pool, which is fenced in, and keep an eye on the hustle and bustle of Ocean Boulevard. There are lounge chairs around swimming pool so you can take it easy and read some magazines while the kids swim or just claim a lounge chair so you can stretch out and get a nice suntan during your North Myrtle Beach vacation at Channel Marker. Across this North Myrtle Beach resort and towards Lake Drive and the saltwater channel you will find a grilling area. What a fantastic idea! Going outside for a North Myrtle Beach vacation barbecue with your favorite foods and treats makes for a wonderful North Myrtle Beach vacation memory. Take advantage of this amenity during your stay at Channel Marker and grill up something delicious for your family. The North Myrtle Beach vacation rentals at Channel Marker all have two bedrooms and two baths. 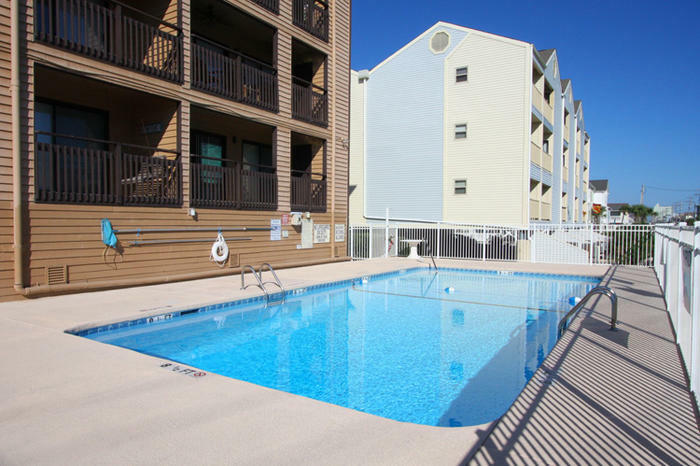 These condos in North Myrtle Beach, South Carolina are full of sunlight and feature a nice list of amenities. From the moment you walk through the front door of these North Myrtle Beach condo rentals you will readily see that your North Myrtle Beach vacation is going to be a good one. These North Myrtle Beach condo rentals feature a nicely furnished kitchen. There is a dishwasher in the kitchen so you don’t have to hand wash your dishes. That is a North Myrtle Beach vacation treat! Having a microwave, refrigerator and even a stove opens up your options for what snacks you can keep on hand during your North Myrtle Beach vacation. These North Myrtle Beach vacation rentals each sleep six people. The bedrooms have accommodations for two people while the sleeper sofa in the living room accommodates two more, for a total of six people. The master bedroom in each of these North Myrtle Beach condominiums opens to the balcony so you can get up with the first hint of sunshine and sneak right out to your private balcony and you can sleep with the door open slightly so as to hear the sounds of the sea all night long. The North Myrtle Beach condominiums at Channel Marker all have some high-tech amenities, too. There is high-speed Internet access in each of these condos in North Myrtle Beach, South Carolina so you can get online with your own personal laptop computer. And all of the vacation rentals at Channel Marker also have a DVD player for your use. Rent a movie in town or bring your favorite flicks with you for a family movie night during your North Myrtle Beach vacation. One of the little details of these North Myrtle Beach condo rentals that everyone loves, especially parents traveling with kids, is the presence of a washing machine and clothes dryer in your private condominium at Channel Marker. These North Myrtle Beach rentals are non-smoking so the air is fresh, but with a washer/dryer unit in each of these condominiums your clothes can be fresh, too. There are ceiling fans in some of these North Myrtle Beach rentals and you can even find accommodations at Channel Marker that boast a Jacuzzi tub for your pleasure. With so many creature comforts at your fingertips and the beach right across the street, you will be pleased with your North Myrtle Beach vacation when you reserve an ocean-view vacation rental at Channel Marker in North Myrtle Beach, South Carolina.